Studying the movement of atoms requires massive computing time, but chemical engineering Ph.D. candidate Sarah Alamdari said Hyak, the UW’s supercomputer, is up to the task. 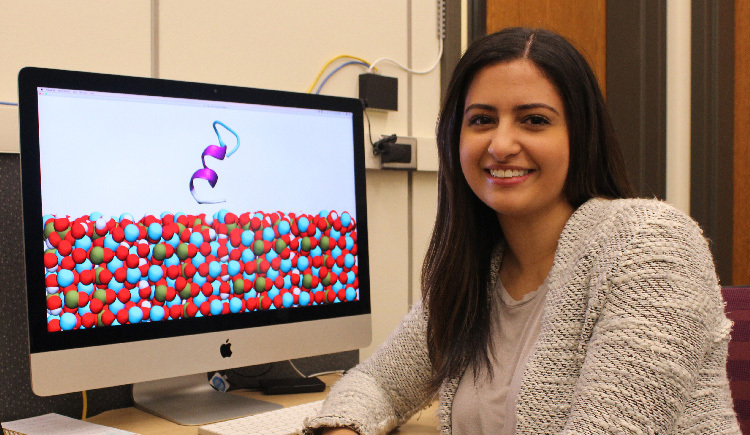 On Sarah Alamdari’s computer screen, thousands of calcium and phosphorus atoms are packed together like billiard balls that are about to be struck by a colorful and wavy ribbon. This molecular dynamics simulation — a method to study the movement of atoms and molecules over a particular window of time — happens in less than a blink of the eye, a mere 100 nanoseconds in time. And it shows the exact moment when a single peptide representing a protein found in human saliva meets a mineral surface representing the enamel surface of the tooth. These 100 nanoseconds may not seem like much, but for Alamdari, a chemical engineering Ph.D. candidate and a member of Jim Pfaendtner’s research group, they represent a new world of possibilities. Measuring the movement of atoms, and their interactions with other atoms can help researchers gain insight into the behavior of biological systems, including our own bodies. That knowledge, in turn, can lead to other discoveries, such as finding dental prosthetics that can better withstand the strong chemistry inside the mouth. But studying the behavior of atoms requires massive amounts of computing time, and can be prohibitively expensive. It took a full month of continuous, intensive computing calculations on the UW’s on-site shared cluster supercomputer, Hyak, to help Alamdari capture how a handful of proteins interface with the surface of the tooth. Without the power of Hyak, this research would not be possible. For Pfaendtner, associate vice provost for research and a chemical engineering associate professor, Hyak has been an important research and recruiting tool — helping him attract a bright crop of chemical engineering superstars to his UW lab. Almost all Pfaendtner’s researchers rely on Hyak to run computer simulations to solve challenging problems — from the basic understanding of how molecules in different materials interact with one another to creating clean energy materials. With others in the Pfaendtner lab, Alamdari has been running simulations on Hyak that specifically target a 15-residue peptide sequence found in saliva. Peptides are fundamental components found in cells, and they carry out key biological functions, such as regulating the activities of other molecules. This sequence is believed to regulate the precipitation of calcium, which plays an important role in regulating many processes in the body. The simulations, Alamdari said, are helping researchers clarify and understand the role of peptides found in saliva. Think of saliva as separate from the surface of the tooth, another system. When these two systems interact, a number of things can happen, Alamdari explained. There may be proteins in the saliva that adhere to the tooth and help prevent cavities. But exactly how do they interact with the enamel surface, and how would that interaction change with an introduced material, such as a titanium implant, for example? Consider that a nanosecond is so short that a single nanosecond is to one second as one second is to approximately 31 years. So why look at such brief interactions? Because a lot can be learned from these brief atomic interactions; also, computationally speaking, just a few nanoseconds of a natural interaction between systems at the atomic level take an incredible amount of computing. Some of Alamdari’s longer 500-nanosecond simulations take about a month of uninterrupted Hyak computing time. She is one of the highest users of Hyak in Pfaendtner’s lab, which in turn is the 5th heaviest user of Hyak at the UW. Hyak, managed and operated by UW Information Technology (UW-IT), recently more than doubled its computational power, added the latest processors, and increased networking speeds and significantly greater data storage capacity. Hyak, the UW’s supercomputer, has attracted talented faculty and students, and continues to grow to meet research needs. These improvements ensure that Hyak will continue to support emerging big data challenges, said Nam Pho, UW-IT’s director of research computing. Also, because of its price structure, Hyak remains highly competitive compared to commercial cloud computing solutions. “Cloud computing offers a lot of versatile choices in terms of hardware, but for research that is very compute intensive on a continuing basis, the costs are quite high,” Pfaendtner said. Hyak, which came to the University in 2010, remains significantly more economical. In the meantime, Pfaendtner has proposed a hybrid computing approach that would allow his lab, or any other lab, to run its work on Hyak but switch to cloud computing if more capacity is needed. Hyak is running at about 90 percent utilization, with well over 100 million central processing units (CPU) hours a year, Pho said. For Alamdari, Hyak means more than just computing power. To her and fellow colleagues, it signifies a commitment by the UW to support data-driven research. “When I first came to the UW, the most powerful software I had used was Microsoft Word,” said Alamdari, who now uses sophisticated computing programming to understand her own work. “After three years at the UW, I’m working on becoming an expert in data science. There’s so much support and so many people who want to see you succeed,” she said. Visit IT Connect for more information on Hyak and to get UW-IT’s research computing assistance. Hyak is not just for faculty. If you’re a student, learn how to become a member of the Research Computing Club and gain access to Hyak. Check out how UW-IT will help advance research in 2019 through high-value computing solutions.